My upline was the inspiration behind the Artfully Aware stamp set. As a million-dollar earner, she had the opportunity to work with SU! designers to create a stamp set. I am so glad to have this set. As much as we don’t want to have our friends and loved ones hurting, it’s great to know there is a set we can turn to in order to make a heartfelt card. 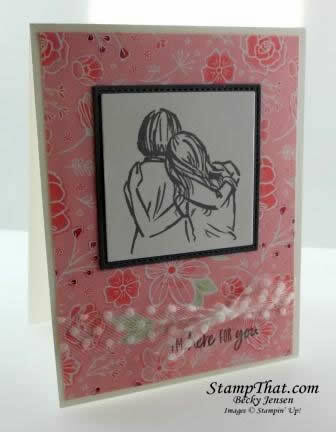 We made this card in our last All Occasion Card Class. This will be our Stamp of the Month in May. I know that’s a ways off, but I mention it so you can keep it in your radar and mark it on your calendar. This is a set I think we can all use. I think the “Artfully Aware Stamp Set” is going to be a big hit. Great job Becky and thanks for sharing this lovely creation of yours.